Many of us know Firefox comes with Proxy Settings feature, which enables us to Configure how our Firefox connects to the internet, Unlike Chrome browser which doesn't come with this same feature. Chromes directly uses your Primary Computer proxy settings on Windows, often times I had tried changing my PC proxy to that of Local host so it would power my Chrome to surf the web, but no success with all my trials. So I had no option, I usually stick to my Firefox because of it's availability to be able to change my Proxy settings to enable it receive data when I'm browsing via tunneling software like YourFreedom, SimpleServer, and few others, these tunnel softwares need you to connect to local host before they work on your browsers, so today I'll share with us, the best, fastest and easiest way to use Proxy servers on Google Chrome, especially via the popular LocalHost address - 127.0.0.1. 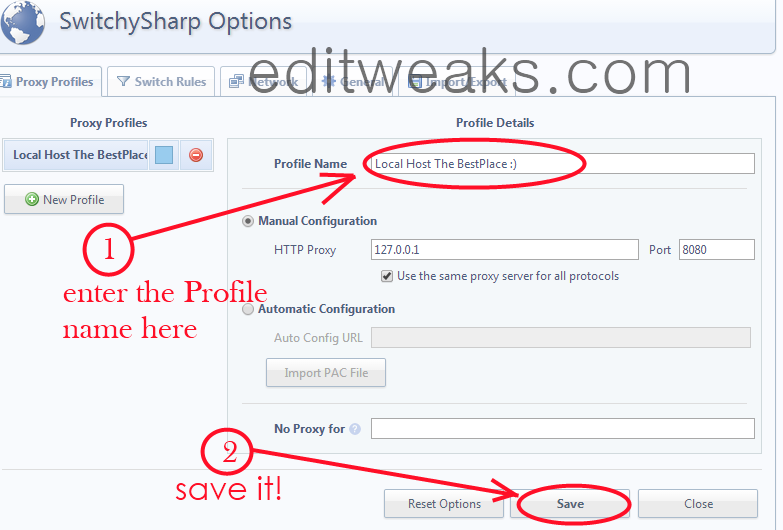 Switchysharp extension for Chrome is very simple to use, helps you manage and change Proxy and ports. My screenshot shows us this, and it's very easy to understand. Simply Go to your Windows Menu icon, search "Run"
Your Chrome open as normal, but will automatically surf the web via the LocalHost or Proxy address and Port your applied on that Command line.